I hope you had a lovely weekend and are having a great Monday. I’m really excited to share with you today a Disney theme post. I’ve really enjoyed writing this one as I love Disney so much and always have done since a very young age. One thing I do love to do is listen to lots of Disney songs, they make me feel happy. When I was younger I went to Walt Disney World with my mum and dad and I loved it there so much. I would love to be able to go back again one day. Anyway for today’s post, even though there are so many more Disney songs that I love listening to, I have written a list of 15 favourite ones. As soon as I listen to these songs they bring back so many good and happy memories. Now I want to watch the films too! 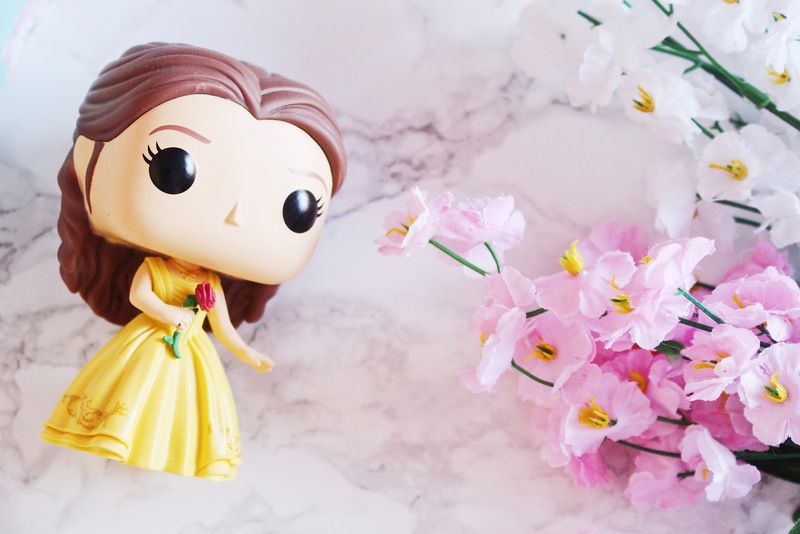 Also how cute is the Belle Pop! Vinyl in the photo above. Quite a while back my friend and I went to the Disney Store and I just had to get Belle. I love the little rose she is holding. 1. Zero to Hero – Hercules. This song is so catchy and I love singing along to it. 2. Prince Ali – Aladdin. The Aladdin films have always been some of my most favourite Disney Films. I remember when I was very young and I was watching the one where Genie leaves at the end and I cried so much! Prince Ali is my favourite song. 3. Under The Sea – The Little Mermaid. It feels so long ago since I watched The Little Mermaid. Under The Sea is a great song and my favourite from the first film. 4. Hakuna Matata – The Lion King. “It means no worries, for the rest of your days.” I love this song so much and singing along to it. 5. I Won’t Say (I’m In Love) – Hercules. I remember that this song is on a Disney CD that I have somewhere and when I went on holiday, I would always put this CD on in the CD Player, this was one of my favourite songs to play from it. 6. Tale as Old as Time – Beauty and the Beast. This one is such a beautiful song and always brings a tear to my eye. 7. Belle – Beauty and the Beast. I especially love Emma Watson’s version of it in the new Beauty and the Beast film. 8. The Beautiful Briny – Bedknobs and Broomsticks. This is one Disney film that I can watch over and over again. The Beautiful Briny is definitely one of the catchiest songs in the film. 9. That’s How You Know – Enchanted. I fell in love with this film so much when it came out. It’s such an amazing and beautiful film with lots of brilliant catchy songs in. 10. After Today – A Goofy Movie. I am a huge A Goofy Movie fan and I love all of the songs from it, but if I had to choose just one song then this one has to be my most favourite. 11. A Dream is a Wish Your Heart Makes – Cinderella. Like the song Tale As Old As Time from Beauty and the Beast, this one is such a beautiful song too. I love it when the little bird joins in with Cinderella. 12. Let’s Go Fly a Kite – Mary Poppins. This another one of those feel-good songs, where when I listen to it, it makes me feel happy. I love how happy everyone is when this song is playing and everyone is flying their Kite. 13. Just Around The Riverbend – Pocahontas. I’ve always found this to be an amazing and powerful song. 14. This Is Halloween – The Nightmare Before Christmas. I love watching The Nightmare Before Christmas and This Is Halloween is my favourite song from the film. 15. Strange Things – Toy Story. There are so many good songs in Toy Story, but I’ve always really liked this one. There are also some really catchy songs in Tangled and also The Princess and the Frog too. I also plan on writing another Disney post real soon on some of my favourite Disney Films. What are some of your favourite Disney songs?